The Seas Shall Be Our Empire! Argh! Greetings from His Excellency, Captain Deacon Dr. Fresh. 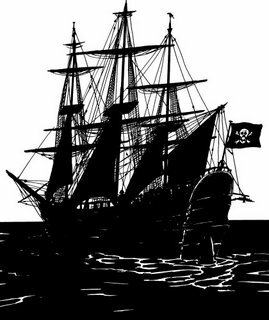 To all in my Pirate Crue, the Legion of Lurch, and my fanz around the electronic wine world, in the name of Calico Jack, I greet you! And a hearty "Bite me crank, matey!" to all you land-lubber, plank walkin', media believin', barnacle-brained DIX out there, who haven't got a brain-cell between you, but tune in anyway in case you miss somethin' good, "Argh!" again! No Virginia, that's not a typo. Is it amazing? Absolutely! Is it worth it? Not a chance in Hades. It drinks more like a $245.00 wine. For the red, your Captain recommends...Ubuntu Shiraz (Western Cape) South Africa 2004 A steal at only $11.00! If y'all like the Aussie and Chilean versions of this Persian grape, you're gonna love this eksepshunal bargain! Available at the LCBO. You can read the Deacon's comments on the back cover of Billy's 2007 Wine Guide. Pick it up! If you buy only these 2 wine books, you'll be miles ahead of all the snobby, jank, peckerdine DIX you hang-out with, but can never figure out why. Well...that's all for today. Your Deacon's gonna retire now to the Captain's Table of the Black Freighter, where the Deaconess has prepared some barbecued beef with all the fixin's!